Dimensions (HxWxD): 4" x 0.375" x 0.375"
These beautiful Multi-Hued Garnet Power Beads are composed of polished garnet gemstones which display an inner radiance from the deep red coloration and can be worn comfortably on your wrist or put into a pocket & used like 'not-to-worry' beads. 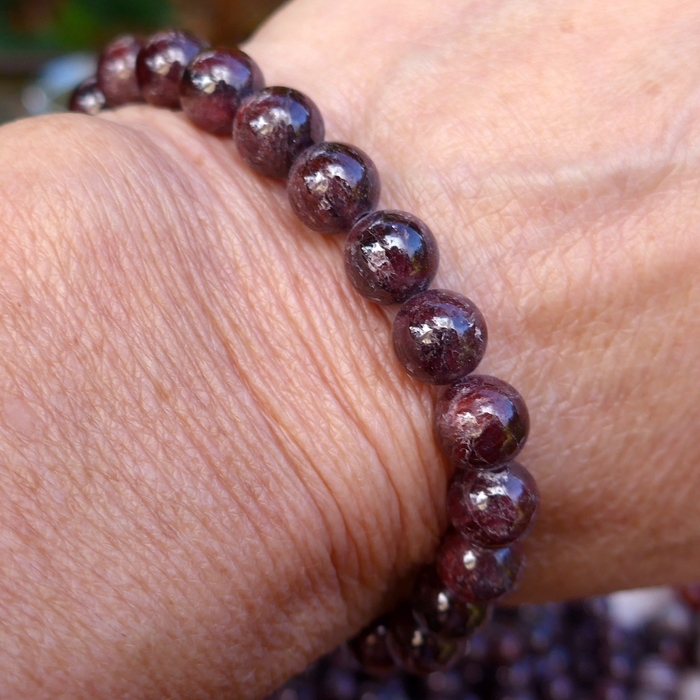 The beads on this bracelet are a bit smaller than our Rich Red Garnet Beads Bracelet which you can see and compare here. These stones are lovely and feel great when worn. Garnets are vitreous, translucent gemstones with a hardness rated significantly above quartz crystal, characterized by the presence of aluminum and manganese, which imparts their striking reddish orange color. Most of all, garnets are the quintessential stone of prosperity, used to manifest abundant wealth and income for millennia in cultures around the world. All these properties are connected to the garnet's connection to the root chakra, which is colored red in the Western chakra system, and which governs issues of survival, adequate prosperity to sustain life, and sexual energy. The root chakra is the site of the coiled kundalini energy which is the fountainhead of all spiritual experiences, and thus the garnet is also thought to awaken the kundalini energy which normally lies dormant in human beings until awakened by a spiritual teacher or by intense spiritual experience of some kind. Garnets typically are used by spiritual healers to transmute negative energy or stuck energy within a sick person into healthy energy, and to restore the proper flow of life force energy throughout the individual's body. First the user experiences a warm rush of chi into the root chakra region, and then a flow of warm energy upward into the second and third chakras. It feels so good! Jane says that she feels the energy traveling all the way from her root chakra up the spine and into the heart! Note: Above weight is shipping weight. Average net weight is 26 grams or .92 ounces. Each bracelet is unique and may vary sligihtly in appearance. Each bracelet is guaranteed to be beautiful and to meet with your complete satisfaction!